The company was known for selling feature phones, but now they are focusing on smartphones as they are the demand of the hour. You must be wondering why I am telling you all this. Zen is a small company started in 2009 about which many of the people has no information. The company has launched a new smartphone in India to the Cinemax series. This model is the successor of ‘Cinemax 2’ and this model is named as ‘Cinemax 3’. The main feature of the device is that it provides SOS feature which makes the device compatible in calling to the five emergency contacts when the device is locked. This feature was recently used in an Intex smartphone. As this is a Government recommended feature; all companies should include it in their devices. 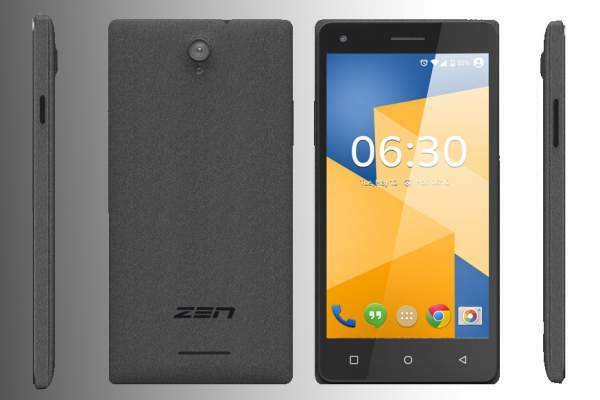 “Zen Cinemax 3 is designed to provide best in class experience to the users by combining quad core processor power, powerful 2900 mAh battery all into one device. The device is loaded with various smart features at an affordable price that provides a seamless experience.” are the words of Sanjay Kalirona, CEO of Zen Mobile on the launch of the device. Cinemax 3 comes with a 5.5 inch FWVGA IPS display with a resolution of 480 x 854 pixels. This model is clocked at 1.3 GHz quad-core processor coupled with 2 GB of RAM. The internal storage of the device is 16 GB which can be expandable up to 32 GB using a microSD card. The device runs on Android OS Lollipop v5.0 and is powered by 2,900 mAh non-removable battery. It is a dual SIM model. It does not support 4G network technology. This smartphone is equipped with a 5-megapixls rear camera with LED flash and auto-focus. Also a 3.2-megapixels camera on the front for selfies and video calling. The device is pre-loaded with apps like NexGenTV, Saavn, and Zen Care app. For connectivity, the device supports WiFi 802.11, GPS, Bluetooth, USB OTG, FM Radio and a 3.5 mm audio jack is embedded in the device. This product is equipped with various sensors like Proximity Sensor, Accelerometer, ambient light sensor, and Gyroscope. Also, there is a pre-installed feature of SOS which is a positive point of the product. The smartphone is launched in the market and is priced at Rs. 5,499. The device is available in black color and sandstone finish. You can get the smartphone from any e-commerce website or any retailer shop across the country. The company is offering a free protection kit which includes a protective case and a screen guard worth Rs. 499.